Hamas and Hizballah, despite representing divergent radical ideologies, continue to strengthen ties in an effort to kill Israelis. Officials from both terrorist groups sometimes meet to coordinate terrorist operations against the Jewish state. Hizballah's leader even bragged about sending Hamas advanced weaponry to target Israel. But recent developments suggest that the Hizballah-Hamas terrorist relationship is reaching a new level. Israeli Defense Minister Avigdor Lieberman revealed last Friday that Hamas is trying to build military infrastructure outside of Gaza and "open new fronts, first of all in south Lebanon" – a region largely under Hizballah control – to carry out terrorist attacks and "threaten the State of Israel." Lieberman offered this assessment days after a car bomb detonated in southern Lebanon, reportedly wounding the brother of senior Hamas figure Osman Hamdan. Hamdan is tasked with overseeing Hamas' external relations in Lebanon. Terrorist groups, even ideological rivals, often collaborate if they believe that they can mutually benefit, especially when trying to combat a common enemy. 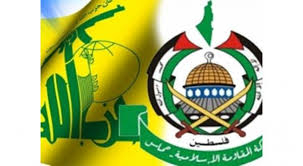 Even though Hamas is a Palestinian Islamist offshoot of the Muslim Brotherhood and Hizballah is an Iranian sponsored Shi'a group, both organizations will likely continue to find common ground in wanting to attack the Jewish state. Last weekend, Hamas official Mahmoud Al-Zahar confirmed that Hamas is strengthening ties with Iran and Hizballah. "Our [Hamas'] relations with Iran and Hizballah have returned to their natural path and we intend to develop these relations," Al-Zahar said in an interview on Al-Quds TV, Israel Hayom reported. Israel also is closely monitoring the budding relationship between senior Hamas official Saleh al-Arouri and Hizballah chief Hassan Nasrallah. Al-Arouri was previously based in Turkey and oversaw the planning and coordination of terrorist attacks in the West Bank. He is now often seen in Lebanon and serves as deputy head of Hamas' political bureau. Last month, Al-Arouri openly boasted about Hamas' ties with Iran and Hizballah, and formally credited the Islamic Republic for arming Palestinian terrorist groups. "Who supports the resistance in Gaza and Palestine? Iran. It is Iran and Hizballah that confront that entity [Israel] along with us," said Al-Arouri in Dec. 30 interview on Al-Quds TV and reported by the Middle East Media Research Institute (MEMRI). He admitted that "the aid Iran provides to the resistance is not merely symbolic" and that "nobody but Iran gives us [Palestinian terrorist groups] any military support." This praise for Iran was followed up by a letter earlier this month from Hamas political chief Ismail Haniyeh to Ayatollah Sayyid Ali Hosseini Khamenei reportedly praising the Islamic Republic "for providing the popular Palestinian resistance movement with various kinds of support." In November, another top Hamas leader confirmed that Hamas and Hizballah restored close military cooperation, following a period of tension after the terrorist groups backed opposing sides in Syria's civil war. Both terrorist organizations have reconciled their differences over Syria to solidify cooperation against their mutual enemy: Israel. But Hamas leaders are not the only ones talking about rejuvenated terrorist cooperation. In an interview with Lebanon's Al-Mayadeen TV earlier this month, Hizballah leader Hassan Nasrallah admitted that his terrorist organization was coordinating with Hamas and other Palestinian groups to target Israel. Nasrallah acknowledged that Hizballah and Iran provides Palestinian terrorist groups with financial assistance and helps organize protests and "other activities." Supporting the "resistance" through "other activities" is Nasrallah's way of conveying Hizballah's commitment to promoting terrorist operations in the West Bank and Israel. Meanwhile, Israel's security authorities uncovered a major plot earlier this month involving Iranian intelligence agents in South Africa seeking to set up a base of terrorist operations in the West Bank. In the past, Iran has relied mainly on Hizballah to recruit and coordinate Palestinian terrorist cells in the West Bank. However, the Lebanese organization failed to secure a major presence in the territory. Helping Hamas secure a foothold in South Lebanon to target Israel in a future war might be one way for Hizballah to overcome failures in the West Bank. Hamas, on the other hand, continues to focus on expanding its terrorist presence to new fronts in light of significant organizational setbacks in the Gaza Strip. Since the 2014 summer war between Israel and Hamas, Israel has made considerable progress in destroying offensive tunnels dug under Israeli territory and continues to deter Hamas from escalating terrorist attacks from Gaza. But Hamas has been cultivating a presence in south Lebanon even before the 2014 war, according to a Meir Amit Intelligence and Terrorism Information Center report. For example, terrorists from Hamas' military wing fired several rockets at Israel from Lebanon during that conflict, proving that a nascent Hamas presence in the region predated the outbreak of hostilities. Shortly after the 2014 war, senior Hamas officials expressed their desire to establish new bases of terrorist operations in Arab countries neighboring Israel. Back then, top Hamas figure Mahmoud al-Zahar requested that the Syrian and Lebanese governments enable Hamas to form military units within both countries' Palestinian refugee camps. Al-Zahar's vision, with Iranian and Hizballah approval, is now being implemented in full-force.